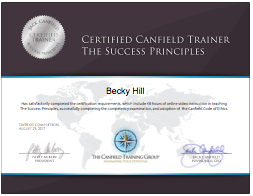 In May 2017 Becky Hill received an invite to train with Jack Canfield and his team to become a certified Canfield Trainer in the Success Principles. On 28th June 2017 Becky successfully completed part 1 and is now officially certified to deliver training using the many tools and exercises within the Success principles, to help people and organisations get from where they are now to where they want to be. Jack Canfield is America’s #1 Human potential coach, corporate trainer, motivational speaker, entrepreneur and author with four decades of experience, helping individuals and organisations shift through the various levels of growth and development. 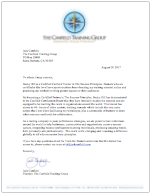 Rebecca will be flying out at the end of July to attend Jack’s “Trainer the Trainer” programme in California where as part of a group of 50 students she will work with Jack Canfield in group settings and have one to one training learning new skills. The benefit of Success Principles for Solutions 42’s clients is enormous. It has been recognised that any company/business that wants to grow and profit has to have a healthy internal culture without this the management and the people will not be in alignment. Solutions 42 will be able to offer its clients comprehensive training by design using the Success Principles that will connect the management, the systems and the people to consistently produce better results for the organisation.